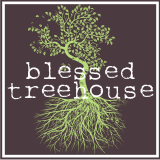 Blessed Treehouse: She's been here four months. How did that happen? It's the middle of December, and I don't know how we got here. I hardly remember September and October, and August is an utter blur. The only events that I recall from November were surviving a four mile jog Thanksgiving morning and the enormouse buck my husband defeated later that weekend. Memory or not, it's been four months since I gave birth to Harper, and it's been the most precious and exhausting four months of my life. I couldn't be happier. In four months she has doubled her birth weight, now hitting the scales at 15 pounds (75th percentile). And she grew to 25 1/2 inches long (90th percentile). She squeezes into 6-12 month clothing, and she is a roly, poly, pudgy, squishy, bundle of bliss. Oh, and how I love her in blue. And are you wondering about these Santa photos? I'll surely post more about these later. There is a good reason why Henry isn't in them. Speaking of, here is Mr. Henry Hooper when he was four months old. Don't you just love these butterball babies? At 4 1/2 months, he weighed close to 17 pounds! And here he is after a feast of mashed bananas. We haven't started Harper on foods yet, mainly because we don't have the energy. Currently we are focusing on weaning her from our bed. We have co-slept with her all four months, and it's time that she moves to her own sleeping quarters. It's been a rough couple of nights, but we know it's in her best interest (I am going to miss her terribly. Selfishly, I absolutely love having that sweet, sweet girl nuzzled up to me each night). After we get this sleeping situation under control, maybe we'll have the energy to give her some good eats! You seriously make the most beautiful children!!!!!! I totally agree with Morgan. She and I were just admiring Harper's delicious plumpness yesterday after church. Happy 4-month Birthday, Harper!! WOW! Too fast! In my experience, things start to smooth out and become MUCH easier after 4 months. I love roly-poly babies, and Harper is the cutest one ever! Love the picture of her with Santa. My babies hated him! I was looking at Harper yesterday in the nursery and I can't believe she's been here 4 months too. I feel like I was just visiting you in the hospital the other day!